The Best Hanukkah Events in Chicagoland – 2018! For our Hanukkah-a-celebratin’ families, we haven’t forgotten you! There are many fun Hanukkah events surrounding the Festival of Lights in the Chicagoland area. 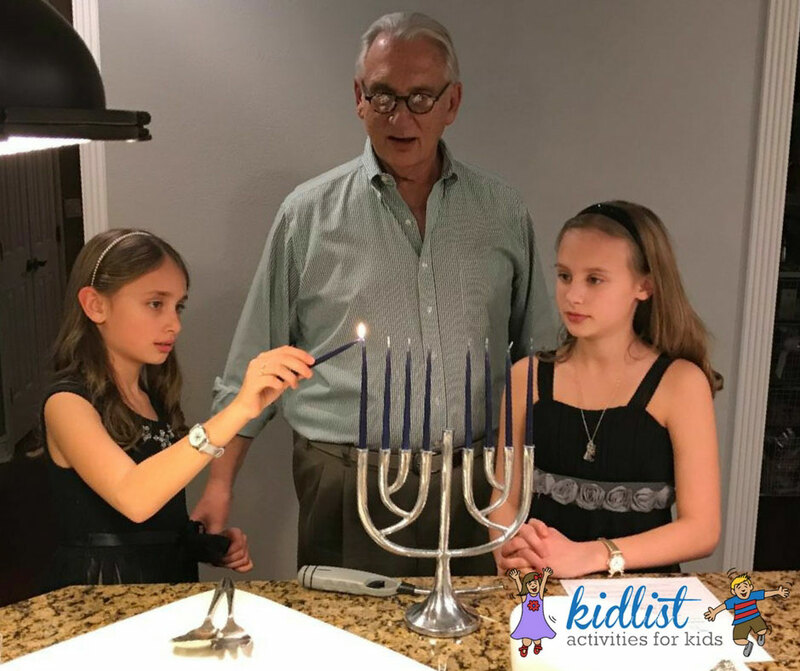 From plays to concerts to parties to delicious eats, Kidlist has you covered for all things Hanukkah. Get your menorahs ready, spin those dreidels and eat potato pancakes to your heart’s delight with these great Hanukkah events! Make all your purchases for Hanukkah in one stop. Hanukkah items of all shapes and sizes…candles, gifts, dreidels, gelt and more! Come light the menorah and celebrate Chanukah with jBaby Chicago and PJ Library at the Naperville Ball Factory! A new play based on the book that tells the adventurous story of Hershel of Ostropol as he defeats a series of goblins over the eight nights of Hanukkah. This fun Hanukkah event includes a kindergartener “humanorah,” Hanukkah somosas fried in oil, a welcoming Hanukkah potluck celebration open to everyone, and more. Latkes and a light supper will be served, and dreidels/gelt will be provided for the children. Kids under 13 attend for free. Adults and kids work together to make a meal, and then enjoy their creation! Hanukkah Party menu includes: Cheesy Kugel, Harvest Salad and Chocolate Cranberry Clusters. Music by the Maxwell Street Klezmer Band! Tickets include the concert and a visit to the Garden’s Wonderland Express. Advance tickets online – $17/members, $20/non-members, free for kids 2 and under. Get some of the best potato pancakes, beef brisket and matzo ball soup in town! They even offer a Kids Night on Wednesdays. A great Jewish deli in the near west suburbs offering some delicious Hanukkah fare. Classic Jewish deli west of Chicago with Hanukkah foods that everyone loves. All the best Hanukkah cookies and challah bread varieties with locations in Schaumburg and Buffalo Grove, too. Order a Hanukkah gift box featuring red velvet, dark chocolate, vanilla cupcakes with blue Star of David sugar decorations and sealed with a Star of David sticker. Check out this neat article for a little inspiration about building new traditions around Hanukkah. Are there Hanukkah events or traditions that you enjoy every year with your family? Please share below! Then, find more fun things to do with kids indoors this winter. Be the first to comment on "The Best Hanukkah Events in Chicagoland – 2018!"